During the past two decades, the use of genetically manipulated animal models in alcohol research has greatly improved the understanding of the mechanisms underlying alcohol addiction. In this chapter, we present an overview of the progress made in this field by summarizing findings obtained from studies of mice harboring global and conditional mutations in genes that influence alcohol-related phenotypes. 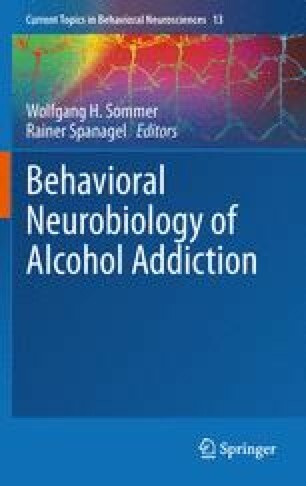 The first part reviews behavioral paradigms for modeling the different phases of the alcohol addiction cycle and other alocohol-induced behavioral phenotypes in mice. The second part reviews the current data available using genetic models targeting the main neurotransmitter and neuropeptide systems involved in the reinforcement and stress pathways, focusing on the phenotypes modeling the alcohol addiction cycle. Finally, the third part will discuss the current findings and future directions, and proposes advanced transgenic mouse models for their potential use in alcohol research.